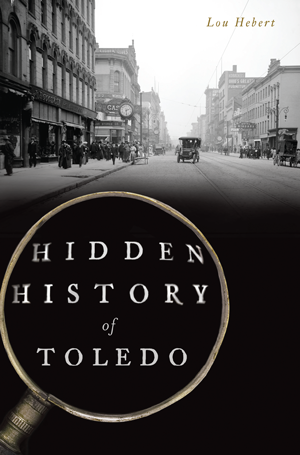 Toledo’s history as a frontier town turned manufacturing powerhouse is well known. However, few know that it was once home to a champion racehorse that galloped into the record books. Many are unaware that East Toledo’s verdant urban woodlands sprang from the work of just one man or that a local girl’s meteoric rise in Golden Age Hollywood saw her play alongside Groucho Marx. Fewer still have heard of Officer Dell Hair, crime fighter and rhyme maker who walked the beat and walked into the history books as a celebrated cop-poet. These tales and more await as award-winning local broadcaster Lou Hebert shines a light into the forgotten corners of Glass City history. Ohio native Lou Hebert attended University of Toledo and Bowling Green State University, but he earned his advanced degrees in life from the many “professors” met around bars, poolrooms, police stations, street corners and factories. His talents as a broadcast journalist have netted him several Emmy Awards, AP Awards and a coveted John Foster Peabody Award for investigative documentary production. Lou is an avid reader who loves nature, writing music and, when he has time, playing golf as badly as he plays guitar. He has five sons and a very understanding and tolerant wife.